The unusual shape of the bean is due to the fact that there is only one bean per coffee cherry, very similar in flavour and character to Pure Kenya. Full of flavour, no caffeine. Very much a Continental style Coffee, a dark roast blend giving a black liquor usually drunk as an 'after dinner coffee'. 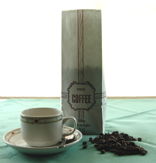 A lively central American blend for all day drinking, giving a delicate flavour.